Like many countries throughout the world at the end of World War Two the CIE had a steam locomotive fleet that was no longer able to satisfactorily handle the its passenger and freight traffic. Its fleet of almost 450 locomotives had suffered from arrears of maintenance, lack of spares, a high average age and the heavy burden imposed by increased traffic throught out the war years. Over one quarter of the fleet were out of service awaiting shopping. Thus with the hostilities over and a growing global supply of diesel powered locomotives the Board of the CIE approved an order in 1946 for two mixed traffic locomotives and five shunting locomotives. The two 800/1000hp machines were required to haul a 360 ton freight train at 40mph or a 120 ton passenger train at 55mph - starting tractive effort was to be 46,000lb and the one hour rating was 23,000lb at 9.5mph. Initially the contact had been made in August 1945 with Brush Electrical Engineering Company of Loughborough being asked to supply two diesel electric locomotives at a cost of not more than EIP35,000 and not less than EIP28,000 for delivery to Dublin. Delivery was expected by August 1947. However with the railway supply industry still under government direction, a shortage of draughtsman within the industry, a shortage of raw materials and a burgeoning demand for new railway equipment the expected delivery date was not going to be met. It was also learned that construction would be transferred to Hunslet, with the power units to be supplied by Mirrlees with Brown-Boveri electrical equipment. The cost for the two locomotives had now risen to EIP104,000, the low axle loading specified required three axle bogies necessitating a longer frame and therefore more materials required. Additionally the electrical equipment was now being sourced from the continent, no doubt with increased costs, delivery was now anticipated for September 1948. Clearly the CIE were not willing to accept these delays and so employed resources within their own company to build not only the two mixed traffic locomotives but also five shunting locomotives. Thus it was left to the CIE's Inchicore drawing office to prepare a number of general drawings under the leadership of J J Johnson, Assistant Mechanical Engineer. One such drawing featured an American style single cab Bo-Bo unit of 915hp weighing 70tons. 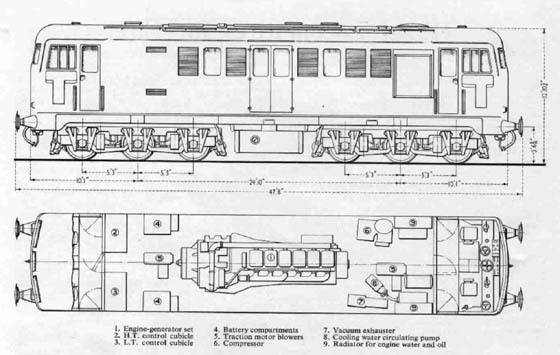 A six cylinder power unit was specified, though no maker was indicated, however four Metrovick Type 271 traction motors were specified in the drawings. Eventually the design that was approved was that which became CIE 1100 & 1100. A stylised view of 1100 & 1101 on a freight train, taken from an AEI brochure from the late 1960's. Sulzer 6LDA28 915hp at 750rpm (one hour) & 815hp at 700rpm (continuous), uprated in 1956 to 960hp. One Metropolitan Vickers eight pole main generator, self-ventilated, self-excited separately excited, with decompounding series field windings (for starting the engine by motoring the generator). Main generator rating was 1270amps 390volts at 700rpm one hour and 1100amps 475volts at 700rpm continuous. One auxiliary generator of 110volt six pole type rated at 50kw at 550rpm, self excited. Bo-Bo wheel arrangement, wheel diameter 44 inches, gear ratio 16:65. Brakes: Westinghouse air brake system for the locomotive, vacuum for the train brakes. Multiple unit working and steam generator equipped, later isolated/removed. Although the orders were placed in 1946 a shortage of materials forced work to proceed slowly such that the first locomotive, 1100, was not available for trials until January 1950. The trials were successful, meeting the specified criteria and on several occasions outperforming that which had been expected. On June 13th 1950 a non-stop run from Dublin to Cork with 350 tons (eleven bogie coaches and a van) was run in four hours ten minutes at an average speed of 40.3mph. A further test train of 440 tons revealed an average fuel consumption of .0016 gallons per gross ton/mile, or approximately 116 gallons of fuel used between Dublin and Cork on such a working. Classified 'C2a' 1100 was painted green passenger locomotive livery and entered service in April 1950. Workings included the afternoon Amiens Street - Cork portion of the Belfast - Cork Enterprise, returning to Dublin the next day on an afternoon working, speeds of upto 60mph were required for this job. Other top link duties over this route included the evening down Cork Mail, returning north with the next day's tough 11.55am passenger and a morning down working followed by an evening Perishables job. The second locomotive, 1101, was not completed until October 1951 and was similar to 1100 apart from the bogies. 1100 was fitted with two non-bolster type bogies, of a riveted construction, the Hoffman roller bearing axleboxes supported by seperate overhung fourteen leaf laminated springs with adjustable hangers, auxiliary helical springs were also provided. 1101 was fitted with a pivotal swing link, though this seemed to do little to improve the notoriously poor ride of both these machines. Although the locomotives were equipped to work in multiple with just one driver this appears to have been a rare event. During May 1955 both locomotives were used with a test train totalling 700 tons. In addition to the rough ride encountered by the train crews the cabs themselves were spartan and uncomfortable to say the least. Cold and cramped seem to be the best adjectives to describe the conditions in the cab, layout of the equipment was poor and little comfort could be obtained from either of the tip-up seats that were bolted to the cab bulkhead. Inchicore diesel shed on May 2nd 1952, keeping company with diesel shunter No.1000 are Irish diesel pioneers 1100 & 1101. CIE No. 1100 is seen at Cork during June 1955 with an interesting collection of rolling stock which should not unduly overtax the locomotive. Like the LMS twins 10000/01 on British Railways once deliveries took place of newer diesel locomotives and railcars the duties performed by 1100/1101 changed. They were removed from the top link passenger workings, frequently being allocated to freight workings and other lesser duties. The introduction of steam heating vans saw the train heating boilers removed, as was the little used multiple unit operation equipment. Not all the news was bad, the engines were uprated to 960hp, similar to those fitted in the B101 class and in 1957 they were renumbered B113/114. 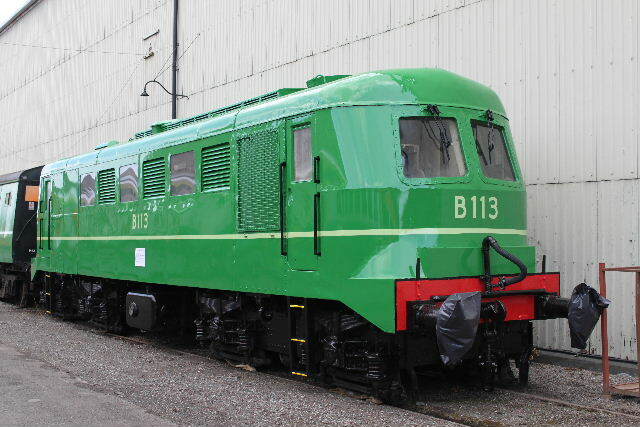 They both received a fresh coat of green paint, B113 being painted early in 1958 for the occasion of the visit of the Institute of Locomotive Engineers to Inchicore Workshops in May 1958, where much rolling stock was exhibited. During 1960 the Northey Boyce rotary exhausters were replaced by Westinghouse exhausters, similar to those fitted to the Crossley A class. B114 and A7 at Cork shed on June 19th 1961. By the late 1960's the locomotives were confined mostly to local work around Dublin, only occasionally making it out onto the main line for longer journeys. The locomotives had throughout their careers been plagued by an unexpected, intermittent loss of brakes whilst on the road. Much study and the use of engineers travelling on the locomotives failed to resolve the issue, frequently the problem would correct itself within minutes. On a number of occasions the runaways were stopped by the application of the handbrakes whilst at other times quick thinking railwaymen diverted the runaways out of harms way allowing gravity and handbrakes to bring the trains to an orderly halt without damage. One such event was recorded on August 28th 1971 when B114 ran away with a heavy goods train whilst running down the 1 in 84 'Gullet'. The driver, not surprisingly jumped from the locomotive, fortunately the signalmen was able to divert the runaway onto the North Wall branch where a rising gradient finally stopped the train without damage. B113 was also involved in a similar runaway whilst working a freight from North Wall. Whilst securing the wagon brakes at Cabra the locomotive lost all air and ran away down the 1 in 65 towards Kingsbridge goods yard, only the diversion of the train into an empty loop prevented a collision. Both locomotives remained out of traffic for some considerable time, but during October 1974 B113 received modifications to the braking system, involving the fitting of chokes on the air pipes leading to the brake cylinders. B114 was so treated in December 1974 but never returned to traffic. Although B113 had returned to traffic its time in service was brief, on January 7th 1975 it ran light to Kingsbridge to work the repairs train to Inchicore, after this duty it was shut down ending its service career with the CIE.
(A) Out of service from January 1972 to October 1974 for brake modifications. (B) Out of Service August 1971 to December 1974 for brake modifications, which were completed but locomotive never returned to service. Tabular information based on data provided by Martin Baumann. Photo Courtesy Aidan Brosnan A fine view of an historic machine, which since its withdrawal in 1975 had seen little activity concerning its place in preservation. It was dragged 'out of the weeds' at Inchicore in February 1996 and given a cosmetic paint job. Regrettably it is missing many components, including quite obviously its marker lights. The locomotive has since remained at Inchicore and is slowly returning to a state of faded paint and rust. As 1100 it carried at least three liveries, dark green, then silver and then possibly something similar to the livery shown above. As B113 it carried black with a yellow cab front. 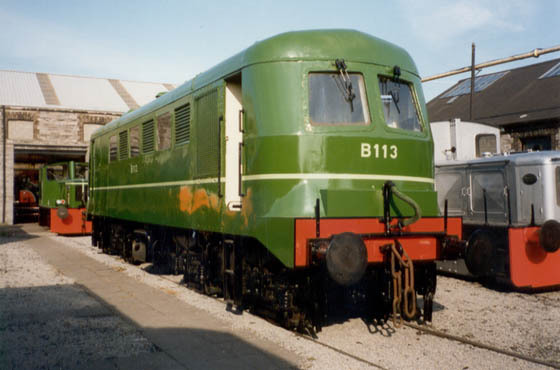 An Open Day at the CIE Inchicore workshops during August 2009 found preserved No.113 decked out in a fresh coat of paint. During 2011 B113 was presented by the CIE to the Ulster Folk & Transport Museum, Whitehead, with movement by road taking place on or about May 12th 2011, during the early morning hours. On January 22nd 2012 B113 moved from Whitehead to its final resting place at the Rail Gallery in Cultra. Photographs courtesy Mark Kennedy. 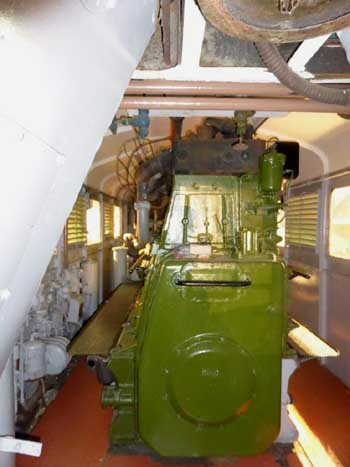 Two views of the engineroom (August 2014) after a cosmetic makeover by members of the Railway Preservation Society of Ireland following the arrival of B113 at UFTM. As detailed below the power unit requires work to place in running condition. B113 is the oldest main line diesel preseved in Ireland or Great Britain. At the time of the move to UFTM the engine, generator and traction motors were present, the turbo charger, along with many part of the control gear and other miscellaneous items were missing. The condition of the brakes, never a great item when in service, would be of considerable concern. The cab interiors are cramped with wooden floor boards. The driving position featured large Continental style throttles like a steering wheel. The driver's seat was of the fold-up type mounted on the bulkhead. The driver's desk was of considerable depth for the amount of controls it contained, with no space for leg-room underneath so the driver would have to lean forward awkwardly to handle the controls whilst keeping a foot on the vigilance pedal. The depth of the driving desk left the cab very cramped. The layout and appearance of the throttle, brake levers, etc. appeared similar to those of the B101 Sulzers and Metro-Vicks. A factory portrait of the first of the Class. During 1948 the CIE placed an order for six 1,800bhp express locomotives for the Dublin - Cork line. Shortly afterwards a change in the Irish government led to attempts to cancel the order. Vickers Armstrong were already well on their way to completing the power units - much debate continued behind the scenes with all parties involved. Its seems that the threat of a substantial cancellation penalty (varying between EIP60,000 & EIP100,000 depending on who your source was) led to the order being changed. Now it would be for twelve mixed-traffic locomotives to incorporate the already completed equipment, of a general purpose design to be constructed by the Birmingham Railway Carriage & Wagon Co. Ltd. An axle loading of just fifteen tons would allow greater route availability for these locomotives. BRCW Builder's numbers were DEL20 - DEL31. The power units were the first Sulzer diesel engines, for railway traction, to be constructed at the Barrow works of Vickers-Armstrongs Ltd. The 6LDA28 engine was now rated at 960bhp at 710rpm for the continuous rating & 1,000bhp for the one hour rating. Cylinder size was 11 inches by 14.2 inches, the exhaust gas turbo charger was of Sulzer make. 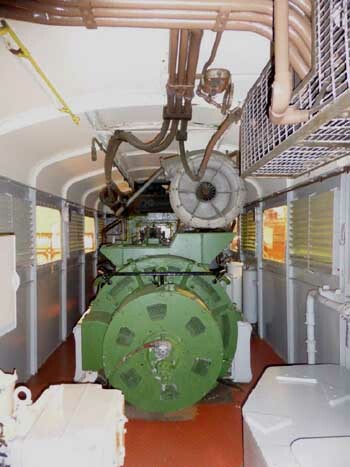 The main & auxiliary generator were provided by Metropolitan Vickers, a common welded steel subframe, forming part of the crankcase structure, supported the engine & generators. 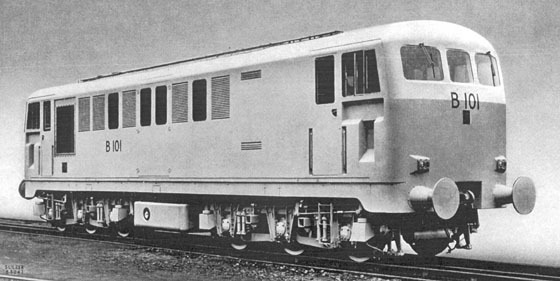 The Vickers built 6LDA28 for use in the CIE 101 class locomotives. They were 47ft 8in long and 12ft 11in high, top speed was 75 mph with a service weight of 75 tons, the maximum axle loading was 14.75 tons. Adhesion weight was about 57 tons with a maximum starting tractive effort of 41,800lb, the continuous rating being 16,900lb at 16mph. This rating would allow a 300 ton train to be hauled between Dublin & Cork without banking assistance on the 1 in 60 gradient near Cork. Two three axles bogies, configured A1A-A1A, supported the locomotive. These were of the modified Pennsylvania swing bolster type, similar to those fitted to the BRCW built Commonwealth Railways of Australia. Wheel diameter was 37.5in, bogie wheel base 10ft 6in, bogie pivot pitch was 24ft 10in. Each bogie frame is an integral welded steel structure in regard to the main longitudinal and crss member, but separate axle box guide plates were secured by driven bolts. The bolster structure is also welded, carrying a flat pivot and side bearers. Swing links are on knife edges, the side swing is stabilised by hydraulic stabilisers. The complete suspension is in the form of nests of helical springs between each compensating beam and the bogie frame, supplemented by hydraulic shock observers. 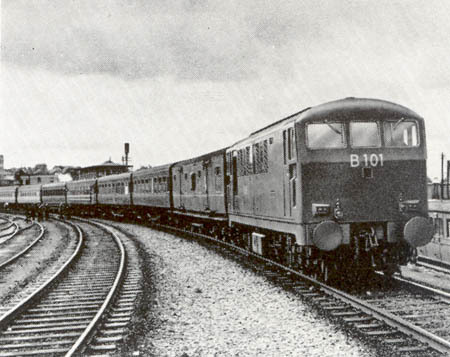 A stylised view of B101 on a passenger train, taken from an AEI brochure from the late 1960's. One piece disc wheels are used, Timken roller bearing boxes support the axles. Braking is of the Westinghouse straight air type, though the train brakes are vacuum only. The superstructure is full width with a cab at each end. Cab side recesses provide accomodation for tablet catcher equipment. Double doors in the center of each side give access to the engine room. All the auxiliaries are electrically driven by individual motors, all located on the engine room floor. These include a reciprocating compressor, reciprocating exhauster, cooling water pump and two traction motor blowers. Batteries are also located in the engine room. A 670 gallon fuel tank is underframe mounted between the bogies. The main water tanks are located beneath each radiator, fuel & water header tanks are located in the roof. A large removeable roof panel permits the lifting of the complete engine/generator set for maintenance/overhaul. Line drawings for the class. After the usual trials and testing the aluminium and silver liveried locomotives were used on passenger & freight workings over the southern section. They were quickly liked by the crews, giving a good ride, with spacious and comfortable cabs when compared to 1100/1101, and proved more reliable than the Crossleys. They became fixtures on the Mallow - Waterford - Tralee line and were regulars on the the line to Limerick & Tralee. They were able to keep time even on the heavier workings and were frequently recorded at sppeds in excess of 70mph. The class would remain intact to the end - their were no premature withdrawals due to accident damage, however there were a number of near misses. Perhaps the most serious incident involved B101 working the 03.50am goods ex-Kingsbridge on March 29th 1959. At Hybla Bridge, near Monasterevan a length of rail had been removed by railway staff without providing protection to the trains. B101 and its train were approaching at about 45mph and were unable to stop before running over the section of line with the rail removed. The locomotive fortunately remained upright, the leading fourteen wagons containing weedkiller chemicals caught fire, blocking both lines. Three breakdown cranes (from Inchicore, Broadstone & Athlone) were needed to clear the wreckage. B101 somehow remained upright in the derailment, preventing major damage to the locomotive, its driver was not seriously injured. Five months later on August 9th 1959 B108 collided with its own train at Limerick Junction whilst running round, minor damage was sustained and four passengers were taken to the hospital. B108 at Tralee on June 5th 1961 & B106 at Kilkenny on June 6th 1961. Interestingly B106 has a white pinstripe as part of its livery. The B101 class were also to be found working many 'last trains' as much of the branch network underwent a severe rationalisation in the 1960's. On January 1st 1963 B101 worked the last regular train on the Castlecomer branch. A month later on February 2nd B109 worked the last regular Youghal passenger. On this same date an un-identified B101 class worked the last Foynes passenger/mixed. The last freight on the Thurles-Clonmel line was hauled by B105 on March 25th 1967 and B106 worked the last train, a weedsprayer, over the Burma Road. The arrival of the 181 Class saw the Sulzers taken off their more important duties, being relegated to goods, permanent way and pilot duties. By the early 1970's the writing was on the wall for them, although the first to be sidelined had been B111 in 1969 after sustaining fire damage. B102 suffered a near miss on August 13th 1970 when it went through the stop-block at Liffey Bridge, Heuston and nearly ended up in the river. On January 10th 1973 a fire in a traction motor on B108 spread to the body sidelining the locomotive, it would never run again. During February 1974 B105 was received at Inchicore with serious cab damage, surprisingly repairs were effected and the locomotive returned to traffic, becoming one of the last four in service. In June of 1974 B106 was recieved for major repairs at Inchicore, it was outshopped in February 1975, the last of the class to recieve heavy repairs. A proposal to re-engine them, along the lines of the A & C class was rejected, the 071 class was purchased instead. Four soldiered on until November 1977 when three were taken out of service, leaving B106 as the last in service. At the end of January 1978 B106 was working the Inchicore repairs train. The locomotive was specially cleaned up and serviced to work the Irish Railway Record Society's 'Farewell to the Sulzers' tour on February 4th 1978 from Dublin (Connolly) to Bray and back. A simple electrical fault the following Monday proved to be the end for B106. The last job worked was the Heuston - North Wall transfer job, after being failed the locomotive was towed back to Inchicore and that was the end of the Sulzers in revenue earning service in Ireland. During June 1980 the B101 class came together for one last time as they were shunted onto the Workman's Siding at Inchicore Works to await their fate - which is tabulated in the list below. All locomotives apart from 103 were scrapped at North Wall Point Yard. Photographs courtesy Neil Webster/collection of Malcolm Braim. The end has come for the 'B' Class - all lined up on one track at Inchicore Works, these views believed taken in 1985/86. Locomotives featured are B101, B102, B103, B105 in the older livery & B107. B107 has had its sides cut away to reveal a very intact engine & generator set. The date is believed to be about February 1987. Throughout their lives the locomotives carried a variety of liveries, not all locomotives carried all the variations. From the factory they were turned out in a silver livery, following this a pale green livery, some carried a light green pinstrip around the entire locomotive. Next came the rather austere, somber looking black livery with a white stripe at roof level. This livery was later amended to include an orange band above the frame level with the band curving round to include the lower cab front. All locomotives carried the first three liveries. The final livery saw the black and the orange reversed, with orange now predominant with a black waist level band applied to the sides and expanding on each cabfront. B105, 108, 109, 111 were stopped before receiving this livery. B105 awaiting breaking up with 112 & 107, probably about February 1987. The locomotive carries one of the earlier liveries, with black predominant with white for the cantrail and cab roof detail & orange for a lower bodyside band and cab front embellishment. During 1977 B103 was earmarked for preservation by Westrail. The option was not immediately taken up, consequently B103 remained in open storage from 1977 to at least 2003, allowing for a gradual deterioration of much of the body work and the internal components. Along with the other members of the Class B103 was stored alongside the up main line at Inchicore. After the other members were scrapped during 1986/87 B103 moved into Inchicore Works for further storage. B103 would be sold to the Irish Traction Group late in April 1993 after Westrial released themselves from their option on the locomotive. B103 departed Inchicore on July 1st 1993, travelling via Kildare and Limerick Junctioon, arriving at Carrick-On-Suir on August 14th 1993. Internally B103 is substantially complete. Two rotors are missing from the load regulator but replacements were obtained ex B114. The traction motor cables are still attached but the two traction motor blowers are missing, though replacements are advised as being easily obtainable. The rocker covers are missing which has allowed water to leak into the engine, the extent of the damage so caused is not yet known. Being one of the earliest 6LDA28's in the United Kingdom & Ireland the rocker covers are not standard, all the threads on the engine are Whitworth, creating a problem since there were fewer imperial threaded engines produced and therefore less spares available. Being aluminium the rocker covers were removed at an early stage. Attempts to use covers from a BR Class 47 failed, these have additional cut outs for pipes not found on B103. Half of the turbo charger is missing, but one was retrieved from B114 before it was broken up. A vacuum brake handle is missing as are two of the removeable loco air brake handles. Nearly all thirty six radiator elements are missing, though an almost full replacement set is to hand acquired from a 'C' Class loco scrapped at Inchicore. Late in November 2003 several hardy Irish Traction Group volunteers were able to sheet B103 in plastic providing a little protection from the elements. Inside the engine room of B103, sometime in 2005. High tension electrical control equipment, advanced technology from the early 1950's. The low tension electrical control equipment from B103. During 2004 asbestos discovered in the cab doors and cab/engine room bulkheads was professionally removed. By May 2010 a protective cladding had been built around the locomotive to provide protection from the elements. The following notes and logs have been provided by Dermot Mansfield to add a little more detail about the operation of the CIE's Sulzer powered locomotives. These notes hopefully add to the existing information above, although at this time these notes do make some corrections to the original text above - I have not had chance to incorporate these corrections yet. The early Sulzers, 1100 & 1101 (1950/51) never worked on the more demanding passenger duties, which required the steam 4-6-0s of classes 400 and 500 (2 cyl) and 800 (3-cyl). And certainly they never headed the Dublin to Cork extension of the Belfast to Dublin Enterprise express, which ran from 1950 to 1953. As mentioned in driver Dan Renehan�s article on the Sulzers in the Journal of the Irish Railway Record Society (Oct 1981), they could be found working the heavy 20.00 down Cork Night Mail and the following day�s 11.55 up passenger from Cork, as well at the 08.00 down and the 20.30 up Night Mail. Occasionally they were found on the Sunday down and up all-stations stopping trains. The notes below refer to the Dublin-Cork double track mainline, 165.3 miles long, and which, although well engineered, in the post-war period had an overall 70 mph speed limit imposed. There were a few intervening lower limits, such as 50mph through Portarlington and Mallow stations. I might add that of course the Irish gauge was wider than that in Britain, at 5ft 3in. Below are details from a log, copied a long time ago from a notebook of Leslie Hyland, of a run with 1101 on the up 11.50 ex Cork Sunday train, from Limerick Junction onwards, timed on February 6th 1955. The load was 7 bogie coaches, 212 tons tare. (Unfortunately I only took down details of the main stops, and not of the stops at smaller intervening stations). Stops were made at Dundrum and Goold�s Cross but the times were not recorded. The speed did not exceed 50mph between Limerick Junction and Thurles. Between Thurles and Ballybrophy stops were made at Templemore and Lisduff, speeds on this section had been 50mph before Templemore, and 53.5mph before Ballybrophy. Beyond Ballybrophy speed reached 59 mph down the 1 in 128 bank before the stop was made at Mountrath, 53 mph was attained after this stop. Between Portlaoise and Portarlington a maximum of 57mph was achieved on the slight downgrades. At Portarlington the lateness was cut to 7 minutes, the 5 minutes allowed here for watering the steam locomotives was cut to 1 minute by the presence of the diesel. Stops followed at Monasterevin, Kildare, Newbridge, and Sallins, before terminating at Dublin Kingsbridge, now 7 minutes late. After the Sallins stop, and on a slightly favourable incline (1 in 450), speed reached 60 mph, and remained in the upper 50�s thereafter for some miles. I don�t know whether this was an average performance, or one below normal. But it does show how limited these locomotivess were on passenger work. The steam engines, between stations on the Sunday trains, would often gallop up to about 60-65 mph, and thus keep time. 1100 & 1101 were out of their league! Later, when they were numbered B113 & B114, I had a number of runs myself behind them working the 12.40 ex Dublin light passenger, a weekday train, stopping also at all stations. Even though they had been theoretically uprated at this point from 915hp to 960hp, they were still sluggish. I think they were a little more adequate on goods turns, which along with short freight transfers, and shunting, was their lot towards the end of their time. The twelve class B101 Sulzers (1956-57) were fine machines and much admired. Their 6LDA28 units, incidentally, had been constructed after an order had been placed in 1948 � but later cancelled � for six powerful express mainline locomotives, which would have had two units in each locomotive. Especially, I remember them working between Dublin and Cork on the three-hour expresses, which, with or without an intervening stop at Limerick Junction, required an overall 55 mph average start-to-stop. They shared this duty with the AEC railcar sets and the A Class 1,200hp Crossley powered locomotive-hauled trains. I never saw them on the heaviest trains on this route, namely the 10.45 down, the 11.30 up and the 15.35 up Day Mail, all of which were solely the province of the A Class. But they could be found on the other services mentioned above in connection with No. 1100 & 1101, although again I never saw one on the Sunday trains. They sometimes worked Dublin to Limerick, which service branched off the mainline at Ballybrophy, and went onto Limerick via Roscrea and Nenagh. Occasionally they were seen on Dublin to Tralee trains, branching off at Mallow and going via Killarney to Tralee, at 207 miles the longest route in Ireland. For me, living beside Portarlington station, they were most regularly to be seen on the Dublin to Waterford passenger trains via Portlaoise, Abbeyleix and Kilkenny. Again they shared duties here with the AEC railcars and the A Class Crossleys. They also worked the other route to Waterford, from Cherryville Junction south of Kildare, through Carlow and into Kilkenny. Also, as Dan Renehan states, �they made the Mallow-Waterford-Rosslare line their own�. This was a twisting and steeply graded line, over which the Cork to Rosslare Express had run since 1907, and which before the arrival of the Sulzers had been a favourite route of the SR type Maunsell moguls (known in Ireland as �Woolwiches�). And one other line was also frequented by the Sulzers, that between Waterford and Limerick, via Clonmel and Limerick Junction. They were also to be seen regularly on goods trains of various kinds. Let me set out as best I can the log of a run with B103 on the 14.25 ex Dublin Kingsbridge three-hour express to Cork, timed on 22nd November 1956 by the late R.N. Clements. The load was a light winter one of five bogie coaches, a 4-wheel luggage van and a 4-wheel heating van, weighing 174 tons tare, and I suppose 190 loaded. This train had a scheduled intervening stop at Limerick Junction of 3 minutes (but an extra 2 minutes was required here, as trains in both directions had to reverse back to the platform after an initial stop on the running lines). As will be seen, there was also on this occasion a short out-of-course stop at Ballybrophy. There is a sharp climb out of Kingsbridge, including 1 in 84 up to Inchicore Engineering Works, and 1 in 100/138 thereafter. Hence the slow time to Clondalkin. Later, the line climbs at 1 in 172 from Newbridge to the Curragh, and falls at 1 in 180 from Kildare towards Monasterevin. The next major rise is at 1 in 128 for nearly 3 miles to Post 65. Net time for the first part of this run was 110.30, scheduled time was 117.00 minutes. Scheduled time for the second part of the trip was 65.00 minutes. The climb out of Limerick Junction to Post 109.5 is at 1 in 156. Then, after rising mainly at 1 in 178/142 from Buttevant towards Post 140, there is a fall at 1 in 150 towards the Blackwater river viaduct at Mallow. There follows a long climb at 1 in 125 then at 1 in 140 up to Post 151.5, after which the line drops down towards Cork. But from Rathpeacon there is a sheer fall at 1 in 60 for two miles, and then at 1 in 64/78 through the mile long tunnel before Cork station itself. B103 did well, getting ahead of time early on, to allow for the Ballybrophy stop and the two permanent way slacks in the Thurles area. The locomotive would have been notched back considerably on some of the down grades, so as not to exceed the 70 mph limit. Obviously from the last summit, at Post 151.5, the train was running very easily, to avoid an early arrival in Cork. I would say that it would have just about managed the schedule with an extra two bogie coaches, say about 230 tons tare. But sometimes, in the down direction, the prevailing south-westerly headwinds could hold a train back on the more exposed sections of line, and therefore the B101 class could have run a little late. By way of comparison, there is a run on the same service between Dublin and Limerick Junction with a 1,200 hp A Class locomotive published in The Railway World, February 1970. Probably timed around 1960, it features A55 with 9 coaches, weighing 250 tons tare and 270 loaded. Despite a signal stop of over a minute at Lucan, soon after Clondalkin, and permanent way slacks at Portarlington and Ballybrophy, the Crossley engined diesel brought its train into Limerick Junction a minute and a half early. From Lucan starting signal to the first stop at Limerick Junction, the 100.2 miles were run in 99 min 37 sec, or 97 minutes net. To add an earlier steam comparison, mention can be made of a run with the Enterprise between Limerick Junction and Cork, timed in August 1953. The large 3 cyl 4-6-0 No. 802 Tailte, with a train of 235 tons tare, and 250 tons loaded, and needing to make up some lost time, covered the distance of 58.4 miles in 61 min 26 sec (68 min allowed in the working timetable, but 73 in the public one). No 802 was over 1.5 min slower to Emly than B103, but then gradually overtook the diesel. In particular it climbed the 1 in 140 past Mourne Abbey at a steady 52 mph, and then was allowed to touch 78 mph before Blarney. Interestingly, on the return journey the next day, when hauling 360 tons loaded, No. 802 ran just as well onwards from Limerick Junction, covering the 82.1 miles from Thurles to Clondalkin in 83 min 30 seconds. Allowing for a permanent way slowing before Portarlington, the net time was 82 minutes, so an even time performance over this distance. This was achieved, with the 70 mph limit scrupulously observed throughout, and even though the engine was running on reduced boiler pressure (180 lb sq in; instead of the original 225 lb). My own closest observations of the B101 class date from the years 1959-1961, when I noted down whatever locomotives passed through Portarlington, mainly on passenger trains, and also had some runs behind them. In August 1959 a friend and myself travelled on the up morning Waterford train from Portarlington to Dublin, behind B104 hauling 7 coaches and a luggage van. This was a sharply-timed train, allowed 47 minutes for the 41.7 miles into Kingsbridge Station, an average of over 53 mph start-to-stop. We had a signal slowing on the approach to Kildare, but on the slightly favourable grades after Newbridge speed fluctuated between 60 and 70 mph. Coming back on the down evening Waterford, we had another B101 class loco (number unrecorded) hauling no less than 10 coaches and van. No doubt we lost a bit of time, but nonetheless we enjoyed every moment of the run home, especially in listening to the purposeful 4-stroke throbbing sound coming from the front. Through 1960 and the first half of 1961, my notebook records many of the class at work, usually on the Waterford trains, and loads varying between 5 to 9 bogie coaches and one or two vans. There were some sightings of them on goods trains, but not much. Then in the Spring of 1961 the first of the General Motors 950 hp locomotives appeared, and such was their success that the B101 Sulzers tended to be relegated to more secondary work, and often on those southern lines between Waterford and Mallow and Limerick as noted above. But in July 1961 I had a lively run behind B101, south from Kilkenny towards Waterford, on a Summer-only service from Dublin via Carlow. We had only two bogie coaches and a van, and so B101 happily worked up to 65 mph soon after leaving Kilkenny, and later did 60 before Thomastown, and 63 mph before Mullinavat. Then came a sudden stop near Waterford, at Kilmacow � where our engine was removed to take the place there of a failed A class on the up main evening train to Dublin! We had to wait until another Crossley locomotive came out from Waterford to the rescue, and take us the rest of the way. B101-112 were engines of modest power. But in the Irish railway scene of the years 1957 to 1961 they were quite prominent, and at the head of important trains, alongside the sixty A class locos, and with the good AEC railcar sets also operating services. To me they were impressive-looking locos, and their 4-stroke sound was full of character. They were solid and reliable, unlike the chronically troublesome Crossley 2-stroke diesels which bore the brunt of the work at that time. And perhaps it is not too much to claim that they played an important early part in the history of Sulzer 6LDA28-powered locomotives, and which of course includes especially the later British Railways locomotives of classes 24 / 25 / 26 / 27, and some of class 33. 'Diesel Railway Traction' November 1956. Sulzer Locomotives of the CIE by D Renehan & CIE - First Diesel Programme by J J Leckey. Page updated May 2nd 2016.